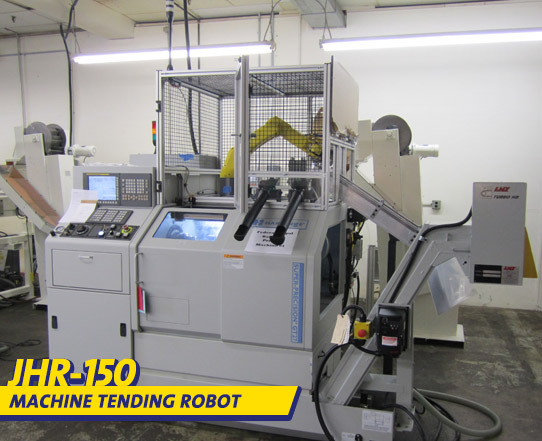 - Machine Tending Robots - JHR-150 - JH Robotics, Inc.
Systems designed to require no additional floor space – all components mounted within machine tool enclosure perimeter. Unit can be easily accommodated to load/unload most low-height machine tools with an appropriate mounting area – lathes, mills, grinders, etc. Front door opens to allow complete access through machine tool front door. Parts can be vertical or horizontal. Can be easily accommodated to load/unload most low-height machine tools with an appropriate mounting area – lathes, mills, grinders, etc. Various input/output options available; bowl feeder input, conveyor input/output, etc. Robot flexibility enables the system to perform secondary operations such as part inspection/gauging, part orientation, etc. These secondary options can easily be added at any time.